Dell Technologies has revealed it would pay US$21.7 billion in cash and stock to buy back shares tied to its interest in software company VMware, returning the computer maker to the stock market without an initial public offering. Dell said the agreement values its equity at between US$61.1 billion and US$70.1 billion, more than twice the value of the US$24.9 billion deal that founder and CEO Michael Dell and buyout firm Silver Lake clinched to take the company private in 2013. The transaction will allow Dell to bypass the traditional IPO process, which would likely have involved grilling by stock market investors over Dell's US$52.7 billion debt pile. It also means Dell will not have to raise any new money, because it will pay for the deal by issuing new shares and with a US$9 billion dividend it will receive from VMware. Going public gives Michael Dell and Silver Lake the option to eventually sell down their stakes, even as they affirmed on Monday that they had no plans to do so. Following the deal, Michael Dell will own 47 per cent to 54 per cent of the combined company, while Silver Lake will own between 16 per cent and 18 per cent. A new public security will give Dell currency it can use to pay for acquisitions beyond cash. The security that Dell is buying back is a so-called tracking stock tied to its 81 per cent economic stake in VMware. VMware specialises in virtualisation, which allows multiple systems and applications to run at the same time on the same server, something can cut companies' IT costs. Dell hopes the deal will allow investors to value it more easily, because it will remove the complexity of the tracking stock, according to sources familiar with the company's thinking. Dell issued the tracking stock in 2016 to buy data storage company EMC for US$67 billion, because it could not pay for the deal in cash. EMC owned the majority stake in VMware, which Dell inherited. Such a security "tracks," or depends, on the financial performance of a specific business unit or operating division of a company rather than the operations of a company as a whole. Dell will exchange each share of VMware tracking stock for 1.3665 shares of its Class C common stock, or US$109 per share in cash, for a total cash consideration of not more than US$9 billion. Dell said it will list its Class C shares on the New York Stock Exchange following the completion of the deal that will eliminate its tracking stock. Following the deal, investors who owned the tracking stock will collectively account for between 20.8 per cent and 31 per cent of Dell's ownership. The transaction represents a premium of 28.9 per cent to the closing price of the tracking stock on Friday. The stock ended 9 per cent higher at US$92.20 on Monday. VMware shares rose 10.2 per cent to US$162.02. "We believe that this development is positive for VMware shares not only because it avoids the reverse merger scenario, but also because there is the possibility of VMware being taken out by Dell in the future as a 'second step' following this transaction," FBN Securities analyst Shebly Seyrafi wrote in a note. Michael Dell has turned to deal-making to transform his company from a PC manufacturer into a broader seller of information technology services to businesses, ranging from storage and servers to networking and cyber security. The strategy is in sharp contrast to that of rival HP Inc, which separated in 2016 from Hewlett Packard Enterprise (HPE), based on the reasoning that two technology companies focused separately on hardware and services would be more nimble. Dell's strategy is beginning to pay off, as companies look to one-stop shops to help them manage their IT infrastructure on the cloud. Dell reported consolidated adjusted cash flow of US$2.4 billion in its latest quarter, up by a third year-on-year. Its total debt has gone down by US$4.6 billion since the EMC deal. 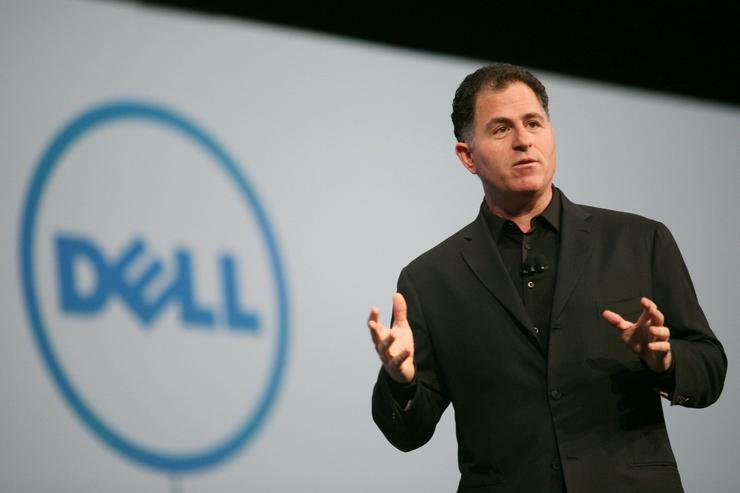 "Dell is a very different company than it was five years or so years ago. And we're seeing tremendous momentum inside the business," Michael Dell told analysts on a conference call.